Can't say much about this... it's not nice to talk with my mouth full. What I can say is the pizza was delicious. 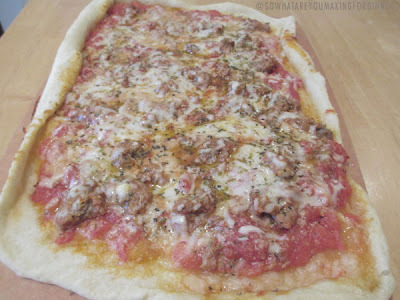 I had the meatballs in the freezer and the pizza dough recipe came from the book My Bread by Jim Lahey. There was only one little piece left. Earlier today I tried a new scone recipe from Cooking Light. Pistachio Cranberry Scones. Weigh or lightly spoon flour into dry measuring cups; level with a knife. Combine flour, baking powder, and salt in a large bowl; cut in butter with a pastry blender or 2 knives until mixture resembles coarse meal. Cover and chill flour mixture 10 minutes. Combine buttermilk and next 4 ingredients (through egg), stirring with a whisk until well blended. Stir in cranberries and nuts. Add buttermilk mixture to flour mixture; stir just until dough is moist. Turn dough out onto a lightly floured surface. 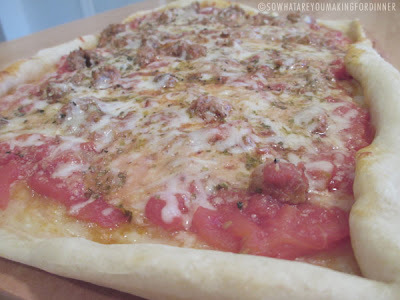 Pat dough into an 8-inch circle on a baking sheet lined with parchment paper. Cut dough into 12 wedges (do not separate the wedges). Brush egg white over dough; sprinkle evenly with turbinado sugar. Bake at 400° for 13 minutes or until golden. Remove from pan; cool 2 minutes on wire racks. Serve warm or at room temperature. Dear Lucia, These sound delicious. 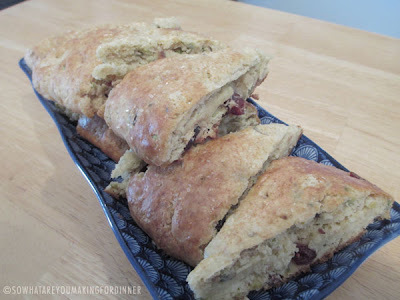 The pistachios and cranberries give it a nice flavor. P.S. That pizza does look delicious.